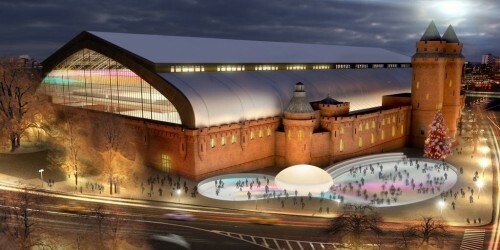 Rendering of the Kingsbridge Armory showing its use as an ice center. New York’s historic armories are getting a second chance at life with the city looking to reimagine both the Crown Heights Armory in Brooklyn and the Kingsbridge Armory in the Bronx. The Crown Heights crowd has been wowed by the adaptive reuse of the Park Slope armory as a community gathering spot. Borough President Marty Markowitz favors a roller rink. Up in the Bronx two developers are duking it out to realized that venue as either a Latin-infused marketplace or an ice skating rink sponsored in part by former Rangers captain Mark Messier. Meanwhile, the grandaddy of repurposed armories, the Park Avenue Armory, announce last week that they secured $15 million from the Thompson Family Foundation toward their own $200 million Herzog & de Meuron renovation.